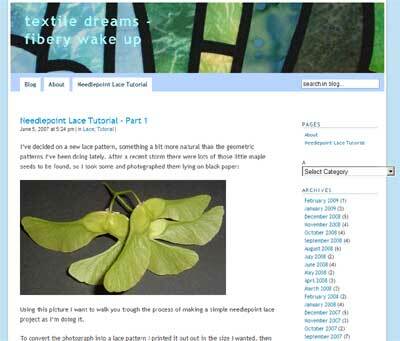 Needlelace Tutorial – Excellent Step-by-Step Instructions! I came across a fabulous step-by-step tutorial for making needle lace when I was looking for (of all things) images of the plaited braid stitch. I was about 10 pages into google’s images under “plaited braid stitch” – long past the point where plaited braid stitches were showing up! – when my attention was arrested by the image of a most intriguing piece of needle lace. Needle lace – or “needlepoint lace” (as it is called on the website I was viewing) is lace that is really made by a series of embroidery stitches worked between couched thread outlines of shapes. There are a variety of different styles of needle lace, and a variety of ways of going about setting up the foundation to work the stitches that make the lace. But one thing most needle laces have in common is the use – in some variety or another – of the buttonhole stitch. For example, take this tiny sample of needle lace I worked up about a year ago, when I was fiddling with Italian cutwork. The fill stitches in the triangle parts of the center are all buttonhole stitch, as are all the stitches covering the lines and the outline. It’s not the most well-executed piece of needle lace in the world, but I recall thinking it was really fun to do at the time! Anyway, to get to the link! The fact that the photo I came across (featured there on the website image above) was needle lace was the first thing that arrested my attention. When I clicked on the photo and enlarged it, without knowing at all where it came from, I was furthered intrigued by it because it looked like…. Guess what? 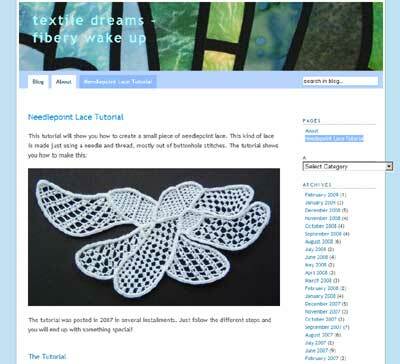 I went to the source of the photo, a website called Textile Dreams – Fibery Wake-up, and found an excellent tutorial on making needle lace, from beginning to end – making the pattern, setting up, laying the foundations threads (with hints and tips along the way), filling the sections with different lace stitches, finishing the edges, and removing the piece from the pattern. An excellent, thorough tutorial! And I was really excited! Someone went to a lot of trouble to put that together, and it’s really well done! The other thing that excited me – silly as it may sound – is that I was right! If you you’d like to see a great tutorial on making needlepoint lace, do stop in and check out the nine steps posted on Textile Dreams! I think you’ll enjoy the thorough tutorial! I know I did. Don’t forget, by the way, to sign up for my January stash give-away if you’re interested in a chance to receive a really nice book and collection of new threads. To enter the drawing, read the original post, follow the directions, and leave a comment on the original post before Wednesday morning, February 4th. I have one piece of embroidery that I miss. though it was hung on the wall anymore I kept it in a drawer. Then the movers lost some of the boxes and it was among the lost. I hadn’t thought of the little, bedraggled piece of embroidery for a long time. Thanks for the memmories. Hi, isn't it just wonderfull where the internet can lead you. Have you ever check out Romanian Point Lace, it is made with a croched cord and needle point filling. I took a class from Sylvia Murariu she is a wonderfull teacher check out her website Sylvia's Flowers & Lace. I have done a bit of both types and someday would like to do some more. Yep, that’s what we called them. Boys would put them in their mouths and make funny noises with them. I tried it once but could never make that noise like the boys did. Oh, dear…my education is showing–they looked like telomeric chromosomes to me!! But yes, we also called them helicopters–they’re one of the world’s great cat toys, too, especially when the breezes blow and you fall over laughing at the cats trying to swat them as they fall…. THIS LOOKS SO INTERESTING. REMINDS ME OF TATTING. I LEARNED TO TATT MANY YEARS AGO. Previous Previous post: Give-Away: Helen Stevens Embroidered Gardens and Some Great Needlework Threads!